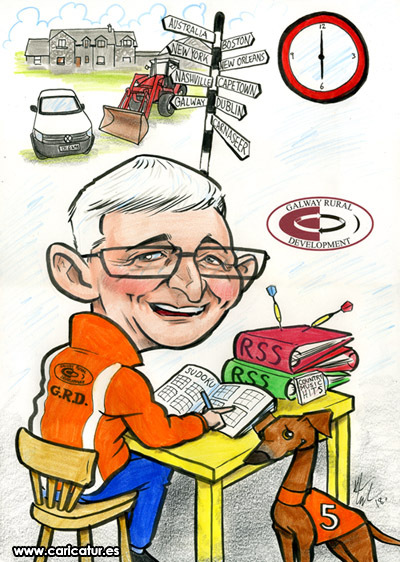 Caricature Retirement Gift Galway: this caricature was a present for a recent retirement. Caricatures are great retirement gift ideas for men and women in all walks of life! The subject here managed projects within Galway Rural Development. He has a love of greyhounds and Sudoko (something I’ve never been able to finish even the simplest level of!) and his tractor and van make an appearance in the background too! He’s very on time for things hence the clock and he’s also a fan of darts, as you can see a few arrows have made it into his work folders! The orange high-vis jacket was a permanent fixture on him at work and I love being able to add these sorts of specific details to my retirement gift caricatures. If you’re looking for a retirement gift in Galway, or anywhere in Ireland for that matter, drop me a line to find out about my caricature gifts! ☆☆☆☆☆ Just received my Caricature from Allan for my fathers retirement. We are absolutely delighted with it. He incorporated everything that we asked in such a humorous way and my father loved it. Allan was so professional and a pleasure to deal with. Would highly recommend him. You can read more of my Google Reviews here. Charlie Adley’s Double Vision – The Sun is Out This Man is Out! Charlie Adley’s Double Vision – I walked in the rain and became Irish!